1. 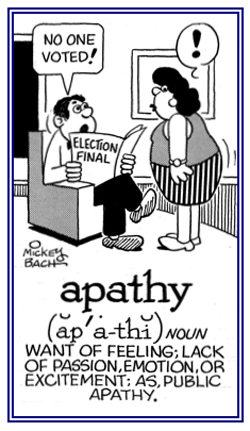 A lack of interest or concern; especially, regarding matters of general importance or appeal; indifference: There was widespread apathy among the voters, seemingly as the result of the ongoing scandals involving some elected officials. 2. Indolence of mind, not caring about what is calculated to move the feelings, or to excite interest or action: The sound of the waves of the ocean and the warmth of the sun on the beach brought on a general sense of apathy among the tourists visiting the popular island resort. 3. 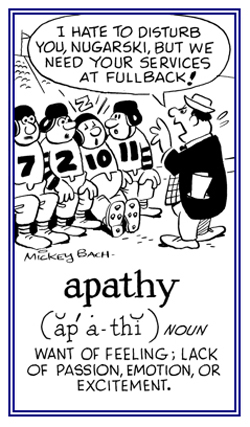 Freedom from, or insensibility to, suffering; hence, no passion or feeling; a passionless existence: From 1847, Lewes Historical Philosophy, "Apathy was considered by the Stoics as the highest condition of Humanity". © ALL rights are reserved. A lack of interest in or being unconcerned about something: Sharon was amazed that the students expressed complete indifference when they heard that their science teacher, Mr. Warren, had to be away for the next two weeks in order to take care of his ailing mother. Science may have found a cure for most evils; but it has found no remedy for the worst of them all—the apathy of human beings. The death of a democracy is not likely to be an assassination by ambush. It will be a slow extinction from apathy, indifference and undernourishment. Bad officials are elected by good citizens who do not vote. The worst sin towards our fellow creatures is not to hate them, but to be indifferent to them; that’s the essence of inhumanity. Love me or hate me, but spare me your indifference. We live by encouragement and die without it—slowly, sadly, angrily.